Aloware is pleased to announce the release of its new, powerful Contact Center solution, which enables small and medium-sized businesses to launch a call center in the cloud. Aloware’s contact center unifies calls, SMS messages, and social messengers into one single platform for businesses and prospects to connect. 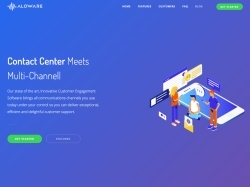 Los Angeles, CA, February 25, 2019 --(PR.com)-- After the successful launch and growth of their Call Tracking platform last year, Aloware is taking the next step in creating a unified, end-to-end communication solution for small and medium-sized businesses. With the advent of mobile phones and mobile search, the younger generation of customers is shifting from calling to texting. This new solution provided by Aloware prepares businesses for the modern age by enabling them to reach their customers across multiple communication channels. This end-to-end engagement software comes with an embedded call tracking system designed to empower marketers with call attribution and reporting technology. Using trackable phone numbers, marketers will be able to understand their callers’ online and offline behavior and determine which marketing campaign is generating more leads to their business. Furthermore, as a communication platform, Aloware simplifies business texting and call routing for teams of any size, helping salespeople take Real-Time Customer Engagement to the next level. “There are way too many tools that a business uses just to communicate with customers. Too many apps and too much clutter. We are creating a truly unified cloud engagement suite to handle what matters most: stellar customer contact, while keeping agents and supervisors happy, productive and efficient,” says Anoosh Roozrock, CEO of Aloware. Aloware has launched its platform with a revolutionary pricing model. Their Pay As You Go model does not require per seat (per agent) license fees and operates solely based on phone call minute usage. The technology is now available to the public, with a 14-day trial period and no contracts required.